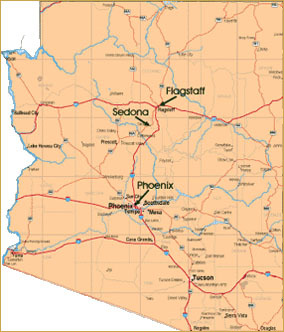 Sedona is located approximately 100 miles north of Phoenix off Interstate 17. 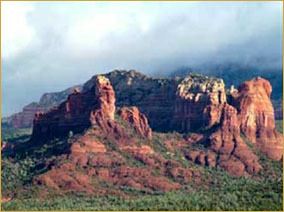 Some people visit Sedona for the breathtaking beauty that fills the senses and feeds the soul. Some visit Sedona to shop in the delightfully eclectic shops and galleries. Many others visit Sedona to savor the flavors and scents of our restaurants, to be pampered in a world-class resort or stay in a log cabin while sampling the diverse cultural events all year long. Click here to read about Sedona - The Most Beautiful Place in America! USA's Weekend's Annual Travel Report. Located in Arizona's high desert under the towering southwestern rim of the vast Colorado Plateau, the city of Sedona is blessed with four mild seasons marked by abundant sunshine and clean air. Ideally, the annual average high and low temperatures are 74.7 and 45.7 degrees, respectively. Almost the entire world knows that Sedona, strategically situated at the mouth of spectacular Oak Creek Canyon, is a unique place. Characterized by massive red-rock formations, as well as the contrasting riparian areas of Oak Creek Canyon, the area surrounding this beloved community is considered at least as beautiful as many national parks. The story about how Sedona was named is well known; nonetheless, a brief telling is appropriate. As the story goes, after Theodore Carl Schnebly and his wife, Sedona, moved to Sedona from Gorin, Missouri, the few families living here convinced T.C. to establish a post office in his large home, which already had become the community's hotel. Various interpretations of this story suggest that he asked the government to name the post office Schnebly Station or Red Rock Crossing. Subsequently, he was told the names were too long, and following a suggestion by his brother, Dorsey Ellsworth Schnebly, he submitted his wife's name, Sedona. And so it was. The city of Sedona, one of Arizona's premier tourism, recreation, resort, retirement and art centers, was incorporated in 1988. Historically, it was a rural ranching community located far off the beaten path, but its unsurpassed natural beauty became nationally known through the motion picture industry. Today, commercials and television shows still are filmed in the unsettled areas surrounding this city, which annually attracts more than 4 million tourists from around the world. Curiously, this 19-square-mile city is split between Coconino and Yavapai counties, and only 51 percent of its area is privately owned - the rest is part of the Coconino National Forest. The average age of Sedona's population, which totals approximately 10,000 within its incorporated limits, is 50 and the elevation generally is considered to be 4,500 feet, though well-known red-rock formations extend to more than a mile-high elevation. Even this city's airport, high on a mesa, is situated at an elevation of more than 4,800 feet, and when airplanes zoom off the end of the runway, the term airborne takes on new meaning. The 12-year-old Sedona-Oak Creek Joint Unified School District includes Sedona Red Rock High School, an extremely handsome facility at the base of Schuerman Mountain, as well as West Sedona Elementary School and Big Park Elementary School, which is located in Village of Oakcreek. Also, numerous private elementary and college prep schools serve students in this area. Yavapai Community College has a campus in Sedona, and Coconino Community College also offers its curriculum to local students. Northern Arizona University is located in nearby Flagstaff, and Arizona State University in Tempe is approximately 100 miles away. Northern Arizona Healthcare is the parent corporation of Flagstaff Medical Center, Verde Valley Medical Center, Sedona Medical Center and Northern Arizona Homecare. Whereas the Flagstaff and Verde Valley hospitals include complete inpatient services, Sedona Medical Center is an outpatient facility that specializes in primary healthcare, emergency services and cancer treatment. Northern Arizona Healthcare also provides additional services, including emergency search and rescue complemented by a medical evacuation helicopter. Residents of Sedona also are served by numerous skilled practitioners who operate in private offices and clinics throughout this immediate area, as well as Sedona Urgent Care. 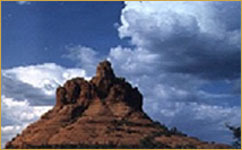 View Sedona Medical Information. A full complement of public services are rendered by impressive institutions such as Sedona Public Library, Sedona Center for Arts & Technology, Sedona Creative Life Center, Sedona Historical Society, Sedona Main Street Program and Sedona Humane Society of Sedona, plus a long list of extremely effective charitable organizations. In fact, volunteerism essentially is a profession in this community especially because so many corporate executives, educators and private entrepreneurs retire in Sedona. Visit the City of Sedona website. 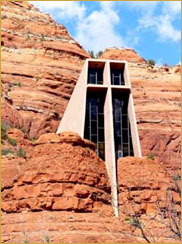 More than 30 churches, many in beautiful buildings specifically oriented to capture inspirational views of this spectacular area, are located in Sedona. View churches and places of worship. The quality of uniquely situated real estate in Sedona never has been questioned. This area has location, location and more location! What has been of concern is availability. However, due to the diligence of courageous developers who acquired parcels of land previously not known to be available, this city is home to a selection of the finest, new residential communities found anywhere in the world. Financial institutions with nationally prominent names, including seven banks some in recently constructed, enlarged headquarters, are located in Sedona. Services provided by Arizona Department of Commerce, including assistance with financing fixed assets and information related to the establishment of new businesses, also are available by calling (800) 542-5684 or contacting Arizona Business Assistance Center, 3800 N. Central Ave., Suite 1650, Phoenix, AZ 85012. Though the fact that parts of Sedona are located in both Coconino and Yavapai counties complicates the matter, it generally is considered that property taxes in this city are fair and reasonable. 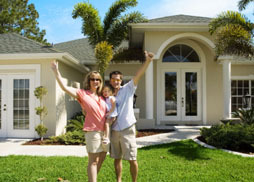 For example, taxes on residential properties total approximately 1 percent of the selling price. Sedona is a friendly place for people with disabilities to enhance quality-of-life and visitor experiences. Most of this community's newer facilities, including various chamber visitor centers and city hall, comply with requirements imposed by ADA (Americans with Disabilities Act). Additional entities such as parks, picnic and camping grounds, restaurants and lodges, theaters and tour companies strive to meet the requests of visitors with special needs. All visitor centers operated by Sedona-Oak Creek Canyon Chamber of Commerce have an extensive list of facilities with accessibility information. For people from the Phoenix metropolitan area, the West Coast, the East, Midwest or Canada who want to acquire real estate in Sedona, now is an excellent time. community uniquely beautiful. Yes, with regard to the three most important elements of desirable real estate location, location and location! this area is mistake-proof. Additionally, evidence indicates that an investment in Sedona property will appreciate more than stocks and bonds. Even better in terms of enjoyable living, the intangibles that will accrue are priceless. Citing the intangibles, experienced developers talk about personal real estate, and they explain that the real value of residential property is vested in personal use and enjoyment. Indeed, the real value of Sedona properties has attracted a market composed of sophisticated people who are aware of the intangible value associated with investing in lifestyle amenities available now, rather than investing in order to acquire these considerable pleasures in the future. These people have had a sufficient number of years to accumulate the means necessary to enjoy themselves today, not tomorrow. 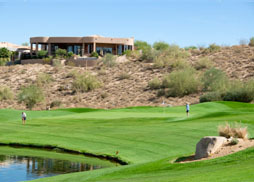 What definitely is known is that the fortunate buyers who subscribe to the today-not-tomorrow philosophy of investing in a unique lifestyle, currently have a wonderful choice of impressive amenities and styles plus location, location and location, of course in Sedona. Locals know, however, that the quality of real estate in this city never has been questioned; instead, what has been a concern is the question of continued availability. At the moment, due to the diligence of courageous developers who found parcels of land previously not known to be for sale, and who were willing to pay the price, Sedona and Village of Oakcreek are sporting a selection of the finest, new residential communities found anywhere in the world. Obviously, these inviting communities feature magnificent, panoramic views but they also offer an astounding array of additional attractions. Almost every choice of lot imaginable is available, from those that sit on high hills or blend into rolling ridges, to the ones that are hidden in cozy little canyons or hug the cliffs of Oak Creek. And while some of these communities feature clubhouses, parks, hiking trails and resort-style pools, others appeal to residents who are not concerned about such things, opting instead for maximum privacy.